Life's Short… So Cater It! ROSE CATERING OFFERS FULL SERVICE CATERING FOR THE PETALUMA, SANTA ROSA, NOVATO AND SURROUNDING AREAS. Rose Catering has a long tradition based upon generations of family cooking and sharing exceptional meals. We understand entertaining family and friends and the importance of exceptional food. We offer off-premise catering, consulting services, and the best food within the area. Download our Mega Bites Business Catering Menus. Breakfast: From our “Here Comes The Sun Continental Breakfast” to our lavish breakfast buffets, each menu includes a deliciously customized spread so you will be sure to look like a hero when getting people fed with the most important meal of the day. 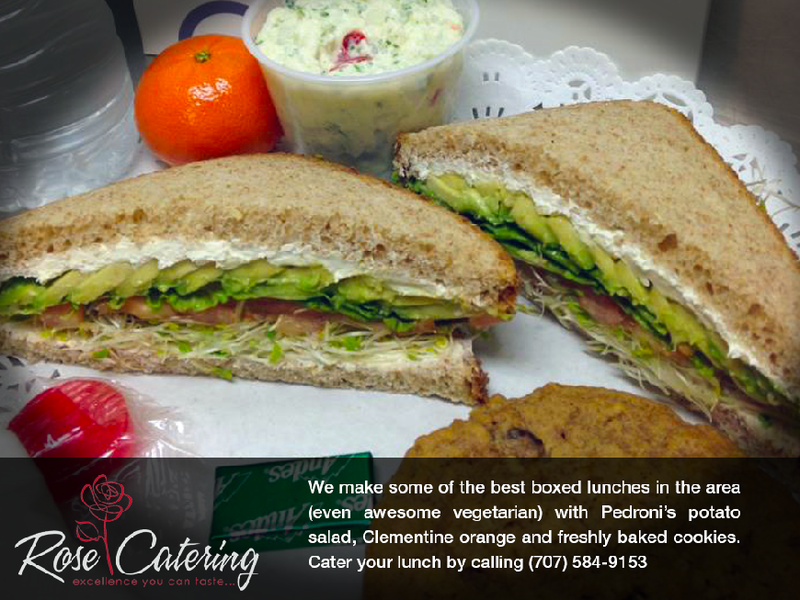 Box Lunches: Sandwich Boxes, Wrap Boxes, Salad Boxes, Specialty Boxes, International Boxes, Executive Boxes and even our own “Junk Food Boxes” are sure to satisfy every taste bud at your event. Luncheon Buffets: Cold Buffets, Pasta Plus Buffets, Hot Buffets, Route 66 Diner Buffets, Barbecue Buffets, Holiday Buffets and our exclusive “Executive Hot Buffets” is a comprehensive way to ensure you look good, no matter who you are setting lunch up for. Pharmaceutical Reps: Special delivery menus are designed for your unique needs. Fill out the form below for more information. Experience some of the best catering in Petaluma, Santa Rosa, and Novato. Give us a call at (707) 584-9153, email us, or Friend us on Facebook for monthly specials! email Us Your Requests and SIGN UP FOR OUR CORPORATE CATERING REWARD’S PROGRAM AND ENJOY UP TO 20% SAVINGS! !